and capitalize each day's work. The SmileLab license adds the data visualization features to Smile, the automation environment by Satimage-Software. 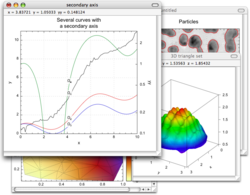 You can use SmileLab as a standard visualization software. But it makes a lot more. Smile is a programming and working environment based on AppleScript. control RS232 serial communications and electrical I/O devices. control Smile in a web browser. Smile is the engine of Quomodo, an amazing new networking web site.